My tomato status for this year is up in the air. Have you ever flipped through a garden catalog? 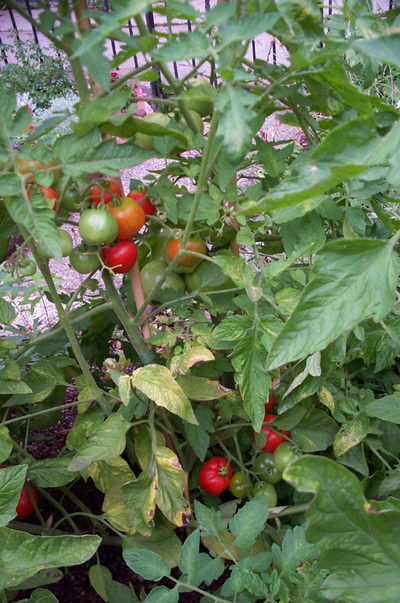 There are typically 2-5 pages devoted to tomato cultivars. It's mind boggling trying to decide which is best unless you've personally grown and tasted them yourself. Anyway, I have way too many succulents in my brightest windows and since I am too lazy to set up some kind of complicated seed-starting indoor lights set up I have no place to start them indoors from seed. This means I must find a source for seedlings. Last year I tried one plant from the Union Square Farmer's Market. Another seedling was obtained from a co-worker and two from my boss, a major "tomato-head" who grows at least 25 varieties each year. I had high hopes for those carefully chosen varieties, but I broke one of them trying to plant it so was left, finally, with 3 plants: Russian Plum, Garden Peach and Black Crim. Weather wise, 2006 was a bad one for tomatoes . Spring was long and cool. I had Russian Plum planted in April. It resented it's cold, wet feet and barely grew. The other two fared no better. 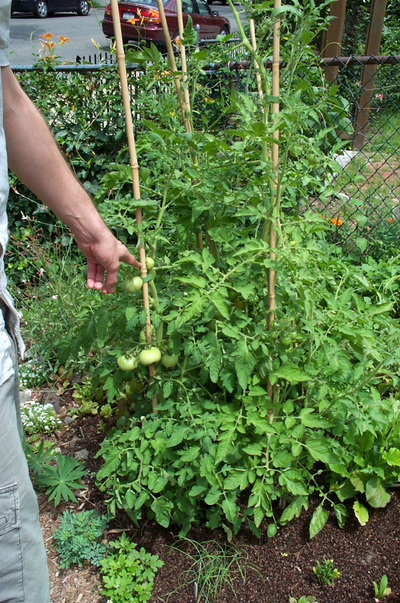 In June and July came lots of heavy rain and gloomy weather not favored by tomato plants. When it turned hot in August they weren't too pretty or healthy or happy. I did get a self-sown "volunteer" which I guessed to be Stupice, a Czech variety I grew in '05, But by the time the fruit was finallly setting, frost was due. We harvested maybe 3 ripe tomatoes along with a bunch of green ones that left much to be desired. So I'm a bit discouraged, but hopeful. My garden is a little small for crop rotation, but my plan is to plant fava beans early, waiting to put tomatoes in their place once they're finished. By May I will surely have a source for seedlings. What a bummer on the tomatoes. I had a few varieties work well last year, and a couple tank. 'Green Zebra' was my best performer. Heirloom variety with medium sized, green/yellow striped fruit. I ended up canning more green tomatoes than red! But they are pretty and sweet.